It all started with the IPL. And the avalanche of liquor ads on television. My father, veteran ad man and prolific blogger, Sandeep Goyal, wrote a scathing piece in Campaign almost as a wake up call to the chairperson of the Advertising Standards Council of India (ASCI). But the article fell on deaf ears. Abanti Sankaranarayanan took no notice. Neither did anyone else at ASCI. Since I assist my father in a lot of his work these days, one evening we got chatting about the article. I suggested to him that besides the wake up piece we should follow the regular protocol of ASCI and lodge formal complaints about the offending brands. Both of us knew that nothing much would possibly come off the complaints but being a lawyer, my law abiding self wanted to give the process a fair chance. My father agreed, and I set about diligently putting together a case under prescribed rules and regulations to the ASCI to discipline liquor brands masquerading under suspect surrogates. But first, an important disclaimer: Both my father and I, despite being complete teetotallers, have no issue with any one smoking or drinking. That is a matter of personal choice. Also, neither of us represents any lobby or activist group. We also are not on any retainer or any other form of incentive by any rival liquor brand. Our efforts to curb and discipline liquor brands from misleading advertising is dictated purely out of a sense of what is right and what is wrong. It is dictated entirely by what is allowed under the law of the land, and what is not. So, we have had no agendas, personal or professional in the pursuit of justice in this matter. On 20 April, 2018, I filed formal complaints against Black & White, Signature, Chivas, Royal Challenge and Seagram’s Royal Stag on the ASCI website in the prescribed format, with all necessary details. On 24 April, 2018, I heard back from ASCI. There were five mails in my inbox. All five mails were almost identical, except of course the brand names and tracking ids mentioned. Reproduced below are two of the mails, on my complaint against Signature and Royal Stag. We acknowledge the receipt of your complaint regarding ‘Signature' (Tracking Id 6162e2b2ecca). However we would require some more details to be able to review your complaint. We request you kindly provide us with the telecast details (Date and time) that the advertisement appeared on Star TV as mentioned in your complaint so that we can procure the said advertisement. Kindly respond by May 3, 2018 on contact@ascionline.org, in absence of a response, the complaint would be closed. We acknowledge the receipt of your complaint regarding ‘Seagram's Royal Stag' (Tracking Id 6162e2d66aab). We request you to kindly view the advertisement link provided in the email and confirm if you have an objection against this advertisement to be able to review your complaint further. I actually did not understand why The Advertising Standards Council of India needed to write to me to obtain information I had already provided in the initial complaint. By asking me for the exact date and time of telecast, the ASCI was really not gaining any new information because the IPL was awash with liquor ads and I had provided YouTube links to the said creatives. In any case, one expected the Complaints Handling team at ASCI to be able to obtain the ads without much ado by simply accessing them on the internet for due reference. Nevertheless, just to keep the process going without hiccups, I dug in to BARC data and provided exact dates and slots on which the said ads were carried in the IPL telecast on the Star network. Each of the five brands had multiple exposures on almost every match. I duly reverted to ASCI with the details. Reproduced below are two of the mails I sent back to ASCI on 27 April, 2018, answering their specific queries on links to the ads under complaint and date / time of appearance of the offending ads. The balance three mails were similar. April 7 - 21:00-21:30; April 9 - 20:30-21:00; April 10 - 21:00-21:30. The ad also appeared on April 12, April 14, April 15, April 18 and April 19 during telecast of the IPL matches. Please take note of the above information as requested by you. Please confirm that you are now taking up the complaint for necessary action. I hope the complaint will now be taken up for necessary action. We thank you for providing us with the youtube advertisement for the complaint against Seagram's Royal Stag' (Tracking Id 6162e2d66aab). We would request you to kindly confirm if you would like us to proceed further with a complaint for the TV Advertisement or the Youtube Advertisement. Kindly respond by May 8, 2018 on contact@ascionline.org, in absence of a response, the complaint would be closed. My simple take on what was going on was that more and more time was being allowed to elapse so that the offending brands could continue their campaigns while I battled all kinds of unnecessary questions from ASCI. Specific to this mail, I had clearly provided the YouTube link as a reference to the TV ad and the question being posed to me by ASCI was at best stupid! I had no choice but to answer the query. See below my mail dated 7 May, 2018 in reply. The complaint is against the TV ad. The YouTube link was a reference to the ad that was played on TV. A week later I received four near-identical mails from ASCI. They now wanted to know if my specific complaint was against the specific TVCs in the links mentioned. It was now 20 days since I had first lodged my complaints and the IPL was well near over. All I had achieved so far was to get ASCI to narrow on to the ads I was complaining against! We acknowledge the receipt of your complaint regarding ‘Chivas' (Tracking Id 6162e2b74b83). However we would require some more details to be able to review your complaint. We request you to kindly view the advertisement link provided in the email and confirm if you have an objection against this advertisement to be able to review your complaint further. Kindly respond by May 15, 2018 on contact@ascionline.org, in absence of a response, the complaint would be closed. I was not really surprised that the links provided in three of the four mails were either incorrect or deficient. I sent back the following four mails. This is the correct ad. However, the link that you have sent is of a 10 second version. Chivas is running 20 seconders edits of the same ad on IPL. The ad of Royal Challenge that you have sent me is correct but the edit is just 10 seconds. Sending you below the link to the correct ad edit. This is the correct ad for Signature. Nearly two weeks later, as the high profile IPL was coming to an end with hundreds and hundreds of liquor ads having run under suspect surrogates, ASCI sent me another beauty! They now again wanted to know what exactly was my complaint?! See below mail received from ASCI on 23 May, 2018. Thank you for your email dated 14th May, 2018 regarding the complaint against the advertisement of Signature (Tracking Id 6162e2b2ecca). However we would require some more details to be able to review your complaint. We request you to kindly elaborate on your complaint against the TVC to be able to review your complaint further. Also kindly provide us with the screenshot of the website selling Liquor. Kindly respond by May 28, 2018 on contact@ascionline.org, in absence of a response, the complaint would be closed. By this time, I had almost conceded defeat because the whole idea of getting wrongful liquor ads off the high profile IPL had been negated by ASCI. Nevertheless, as the curtain came down on the IPL, I sent back all the information ASCI had asked for. See mail dated 28 May, 2018 below, along with which I also sent screenshots of the redirected website. I double-checked that the URL in the TVC actually took me to the website as complained. The TVC is about following your dreams and your passion, leading to one being encouraged to launch their own startup. 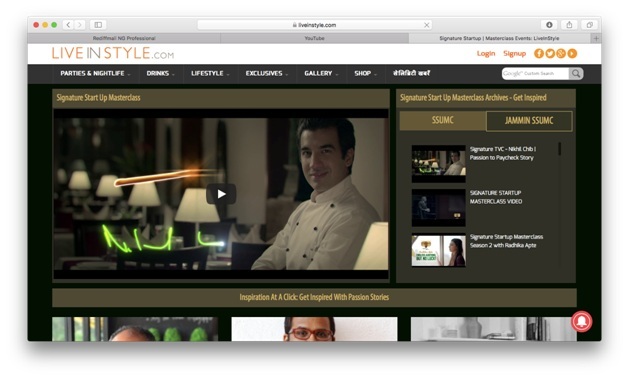 The TVC signs off with the line log on to signaturestartup.in. This link redirects you to a page (4 screenshots attached) that is neither motivational nor provides any guidance for startups. 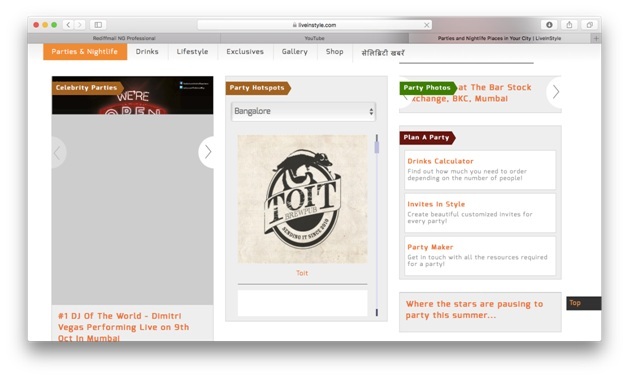 Instead, it is a lifestyle website, giving details and recipes of cocktails, party venues in town and even includes a drinks calculator! Hope this helps. Thank you for writing to ASCI. 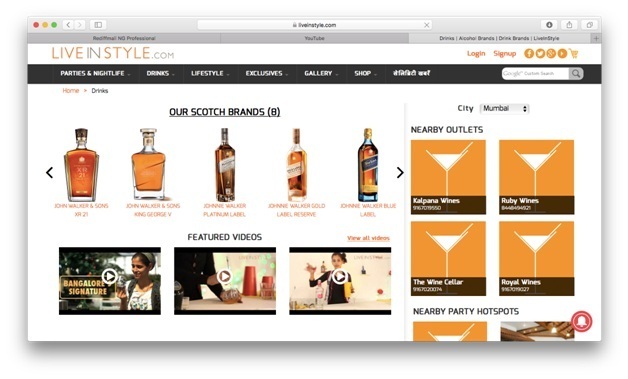 We acknowledge the receipt of your complaint regarding the TVC of 1805-STVC.3 “United Spirits Ltd – Signature Startup"
We would like to update you that your original complaint regarding the website selling liquor does not hold. However on reviewing the TVC the branding "Signature" appears to be a surrogate advertisement, hence your updated complaint will be processed. We have asked the Advertiser for proof of Ministry of Information and Broadcasting (MIB) and CBFC (Censor Board) approval of the product and the advertisement respectively as per the Cable TV Act Rules ad code proviso. If the Advertiser is unable to provide that then the Ad will be considered in violation of the law of the land and we would be updating Ministry of Information and Broadcasting (MIB) & Food Safety Standards Authority of India (FSSAI) accordingly. I really do not know how ASCI reached its learned conclusions about the website. The links and the redirection were unambiguous. 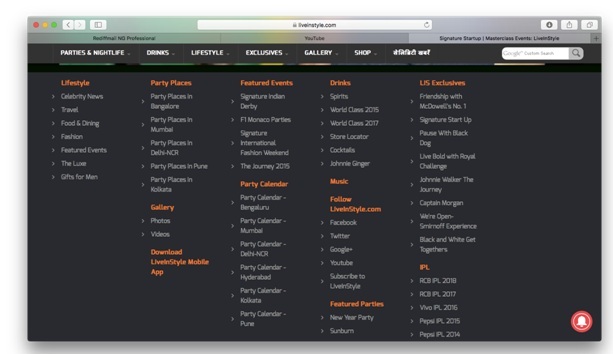 The URL in the TVC takes you to a site, which is nothing but alcohol, alcohol and alcohol. ASCI however must have had its clicks going somewhere that ordinary consumers don’t visit! I do not want to cast aspersions, but, ASCI’s take on the subject seemed fairly dubious to me. But there was hope yet as the mail above at least acknowledged that there was a surrogate involved. We had requested the Advertiser for proof of Ministry of Information and Broadcasting (MIB) and CBFC (Censor Board) approval of the product/service being advertised, and the Ad respectively as per the Cable TV Act Rules ad code proviso. However, as the Advertiser was not able to provide these documents, we are referring this matter to the Ministry of Information and Broadcasting (MIB) & Food Safety Standards Authority of India (FSSAI) accordingly for their perusal and necessary action. So, ASCI had finally conceded that the Signature ad was foul of the law. Of course, I am still waiting to hear back on Black & White, Chivas, Royal Challenge and Seagram’s Royal Stag. This has been a lonely battle, in fact a very personal crusade to see if the law of the land actually merits any respect by those charged to be the regulators and watchdogs of the business. Prasad Sangameshwaram, the managing editor of Campaign India had written a prophetic piece when Abanti Sankaranarayanan took over the reins of ASCI questioning if her being at the helm would actually provide a shield of protection to the liquor industry. From whatever one has witnessed in this case, ASCI is doing just that. The ASCI strategy covertly seems to be to delay, not deny. But ultimately helping liquor brands to unabashedly put out surrogates that are intended to circumvent the law. Liqour ads require a CBFC clearance. With so much visibility in media for these ads, was the Censor Board also sleeping? What about the Ministry for I&B? FSSAI? These august institutions do not even have vigilante wings that take suomoto notice of offending ads that blatantly contravene the law. I am still waiting, as said before, on news of how my other four complaints are being dealt with. In any case, besides the five brands I complained against, as the IPL progressed, more brands joined the surrogate deception trip and were visible on the cricket extravaganza. The sad reality is that all of these brands had a field day (in fact, season),advertising falsehoods selling non-existent products using them to push liquor right under the nose of ASCI, CBFC, MIB and FSSAI. Sad. Really really sad. All I can say about ASCI: Too little, too late. Blog: Why is Abanti Sankaranarayanan sleeping?